Hours: Tuesday-Thursday, 10 a.m.-noon & 2:00-4:00 p.m.
Open some Saturdays. Please call or email for Saturday hours. Opened in May of 2010, the Perry Area Historical Society's Historical Museum offers a collection of artifacts and memorabilia from Perry's earliest days. Of particular interest to researchers is the Museum's Resource Room which contains many family histories and photos. The Museum is located approximately 1/2 mile from Exit 136 on I-75. Click here to see some of the great items available to Museum patrons. Click above for a map of our location. A recent addition to the museum's collection were the tools of Mr. T.F. Hardy. 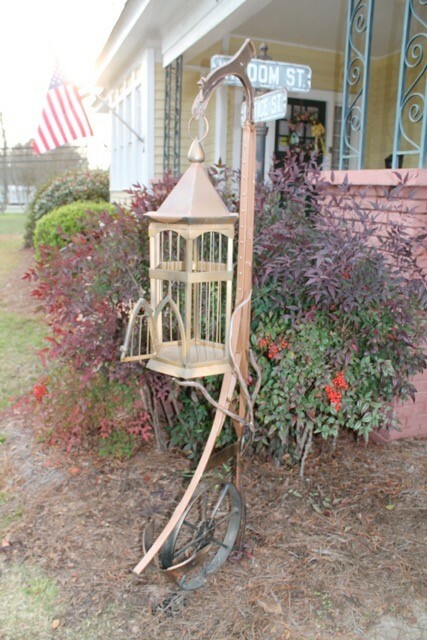 These were made into a birdcage sculpture by local artist Brandon McCullar. Take a tour of the Museum by viewing the photo album at the link below.